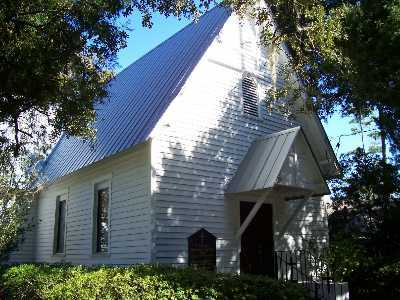 SAINT IGNATIUS CHURCH was built in 1886, as a Mission of Christ Church, Frederica, for the African-Americans living on Saint Simons Island. Anson Dodge had Saint Ignatius and three other mission churches built on the island and, under his direction other Episcopal missions were built on the mainland. The hurricane of 1897 � recorded at the time as a cyclone � almost destroyed the little church, and it was rebuilt. 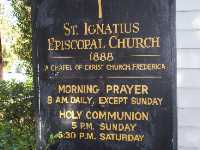 Originally located off a little lane leading to Union Memorial (aka Stranger�s) Cemetery and facing East, St. Ignatius was rebuilt in 1898 on Demere Road, facing South. 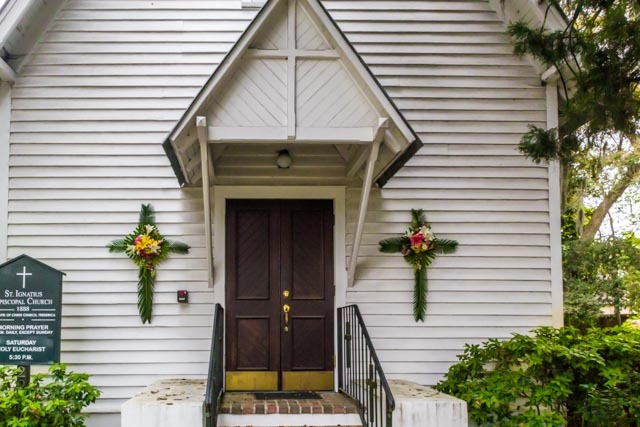 It is built in the traditional cruciform, of heart pine, which inside naturally aged to its present color, the same as Christ Church, Frederica. The Altar rail is hand-carved. The Lectern, Bishop�s chair, Priest�s chair, and Baptismal font were all donated by Lovely Lane Chapel. They were placed here when that church was de-consecrated and used as a recreation center. That building has been re-consecrated and is now Lovely Lane Chapel at Epworth-by-the Sea Conference Center. 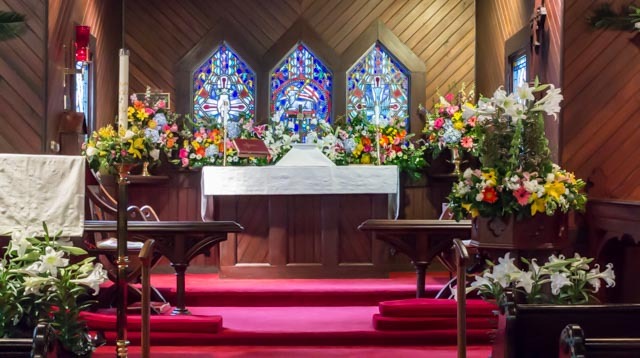 The stained glass windows behind the Altar were made in Philadelphia by the Willet Company. The hand depicts God the Father, the lamb depicts God the Son, and the dove depicts the Holy Spirit. The candlesticks on the Altar were brought from England in 1858. The bell was installed in the 1980's and is from the WWII Liberty Ship Henry Wynkoop. The reed organ was built circa 1900 and installed at Christ Church, Frederica in 1933. The original hand pump is still intact and the pipes are merely decorative. For years, the windows in the Church were translucent, jalousie-panel glass. Ten new stained glass windows were designed in 2000 by M.B. Keys, a parishioner of Christ Church Frederica, and made by the Wippell Company of Exeter, England. The Rt. Rev. Henry I. Louttit, Bishop of Georgia, blessed the new windows April 29, 2001. THE ORGAN was originally in Christ Church, Frederica; a gift of the Berolzheimer family of Little Saint Simons Island and Stockton, California. It is a reed action pump organ. The original pump handle can still be seen on its side. When electricity came to the north end of the island the organ was electrified. It was placed in Saint Ignatius in 1959. The Musgrove Retreat and Conference Center, under the stewardship of The Brenn Foundation, is a beautiful picturesque hidden sanctuary on the banks of Village Creek that takes you back in time. Musgrove is rich with history from its construction in 1938 by Nancy Reynolds Bagley, daughter and heiress to the R.J. Reynolds Tobacco fortune to President Carter�s first pre-inaugural cabinet meeting. Musgrove was named after Mary Musgrove, a pioneer acclaimed as the Pocahontas and Sacagawea of the South and known as a cultural liaison between colonial Georgia and Native American societies for her peace keeping efforts and entrepreneurship. �Musgroves� � so-called by returning conference participants � have become synonymous with thoughtful gatherings that discuss political, environmental and social issues of great local, domestic and global importance. Musgrove primarily focuses on hosting non-profit events including retreats, conferences and fundraisers with an emphasis on giving back to our local community. However, the property is also a picturesque and charming backdrop for select weddings and family reunions throughout the year. 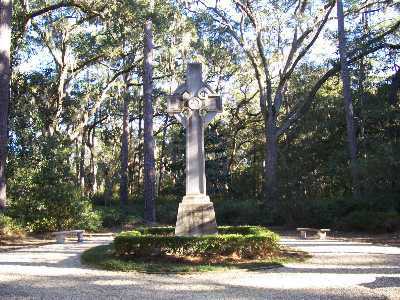 Musgrove boasts nearly 300 acres of primarily preserved natural splendor including marshland between Sea Island and St. Simons Island. Its six residences were designed in the old "Low-Country" style with heavy use of tabby and cypress along with old Savannah gray brick that emphasize the under-stated rustic elegance of the property. Today, the grandchildren of philanthropist Nancy Susan Reynolds continue to lovingly maintain their grandmother's home and vision with purpose. Recently, portions of the property were sold to the St. Simons Land Trust to create more community park and recreational space for the public. 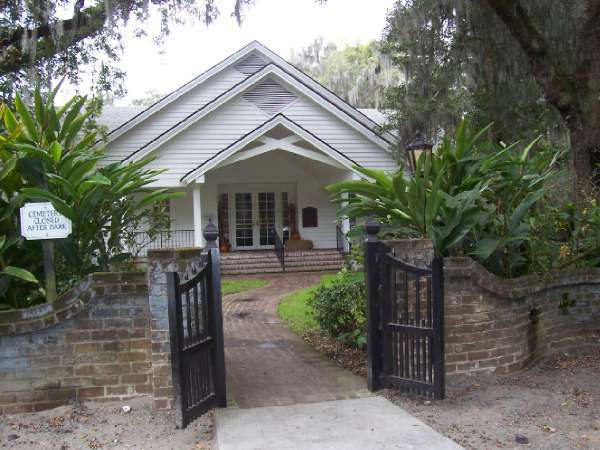 The parish house of historic Christ Church serves as tour headquarters for the Annual Tour of Homes and Gardens. Tea sandwiches, cookies and drinks are offered to our guests by the gracious ladies of the church. We invite you to purchase one of our fabulous cookbooks. As a remembrance of the tour, a token of friendship, or simply an addition to a growing cookbook collection, the Christ Church, Frederica Cookbook encompasses quality, beauty and history visible in its namesake.